States member John Beaman thinks an airline run for the people, by the people would be the best option for the island. Mr Beaman was speaking after former Aurigny pilot Ray Bowyer announced his plans to set up an Alderney-based airline. Mr Bowyer's proposal involves splitting up Aurigny and taking on the company's Trislander fleet to run services from Alderney. He has come forward after Guernsey's Treasury and Resources Department signed an "in principle" agreement to sell Aurigny to Blue Islands. Politicians and business leaders in Alderney have expressed concern over the deal, as it would leave the island with just one airline and potentially cost 27 jobs. Last week Mr Bowyer said a mystery backer was prepared to bankroll his idea to keep the Aurigny brand going. Mr Beaman said: "Something that's run by Alderney, for Alderney people, would be the best option. "I think Mr Bowyer's proposal is elegant and believe Alderney could operate its own airline, so long as there was technical help. 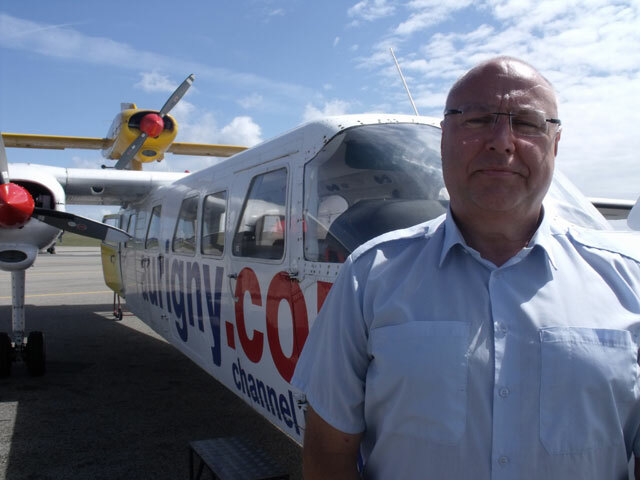 "However, it's important to say Aurigny has not been sold at the moment - it's just a proposal and there are plenty of people in Guernsey and Alderney who would oppose such a takeover. But the idea of having a proper Alderney-based airline sounds very good." Mr Beaman said he would encourage anyone with cash and experience to look at running an airline for Alderney. "I'll talk to anybody who can guarantee us regular routes to Southampton, which is a really good airport for us, and Guernsey, as well as looking at expanding to France and Jersey." Mr Bowyer, who lives in St Peter Port, said he had received a massive amount of support since going public about his plans, which do not involve competing with Blue Islands between Guernsey and Jersey. "It's been amazing. So many people have either stopped me or phoned me up. In some cases people have said they'll offer all the support I need. The finance is in place but I'm sure there are a lot of people who would like to join in if they had the chance." Mr Bowyer, 53, said it was now up to the politicians to back his idea, which would eventually lead to a co-operative airline being set up. "At the moment it's early days. It's up to the States of Guernsey to show interest in splitting up Aurigny. The next step is to gauge the political will to keep the Aurigny brand going." A Blue Islands spokesman said: "Due to the sale process only being in the very early stages of due diligence, it is therefore too early to be able to consider such proposals. Blue Islands will only be able to consider such strategic decisions should the sale be successful." A T&R spokesman confirmed that Mr Bowyer's proposal was received last Friday. The spokesman said it would be considered by the full board at the earliest opportunity. Click here to read Mr Bowyer's proposal.